Since dedicating his heart to being a comedian, T.C. has touched people everywhere with the message, "Laughing is Living" as a technique for survivial. As a child, when family gatherings became a time to act silly and onerous, T.C. figured, "I can live with that." When young and old friends came over to hear local imitations, T.C. figured, "Laughing is Living" and everybody can live with that'. Believing that "old" compliments "new" and being "bad" is in no way "good", T.C. crosses lines to teach "right" with laughing as a cure. Since performing comedy, T.C. has worked with comedians such as Bernie Mac, D.L. 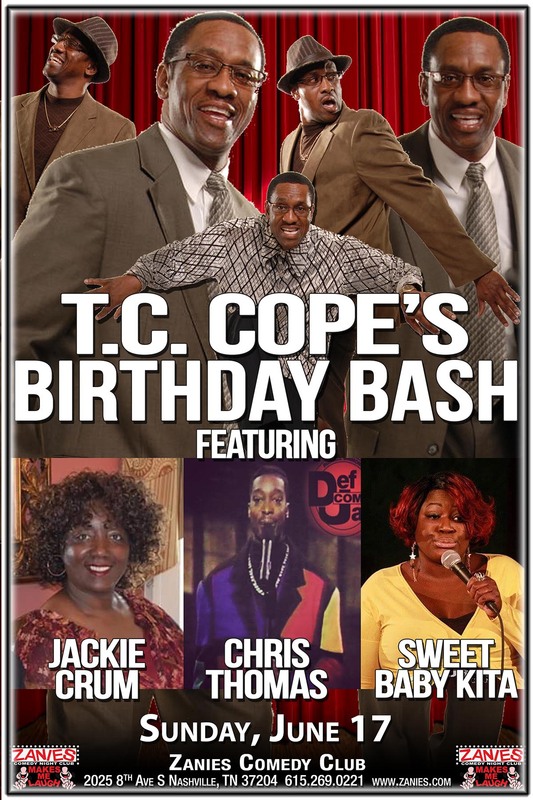 Hughley, Ted Carpenter, Chris Thomas, George Wallace, Joe Torre, Edwonda White, Hamburger Jones, Reggie Ballard (Bro-Man), Adele Givens and a host of others. T.C. has also touched his community with a local television show "The Comedy Thang," which aired two pilot shows. The show was sponsored by an organization called "Grifcot Productions". He has also found it very important to stay in contact with a number of guide-right programs and charitable organizations. He believes "Laughing is Living" , but also "listening is learning". Born on the outskirts of New York City but brought up in the middle of Tennessee, T.C. has left many audiences teary-eyed with his southern punch yet sharp city-type humor. His slender body and laugh line smile have given him a talent for making people laugh and leaving audiences begging for more. With many years pictured ahead, T.C. expresses the thought of "Laughing is Living" in every God-given breath. With many years pictured ahead, T.C. expresses the thought of "Laughing is Living" in every God given breath. Mr. Henry's Comedy & Jazz Club - Washington, D.C.